Wait, I know we are here to talk fashion! 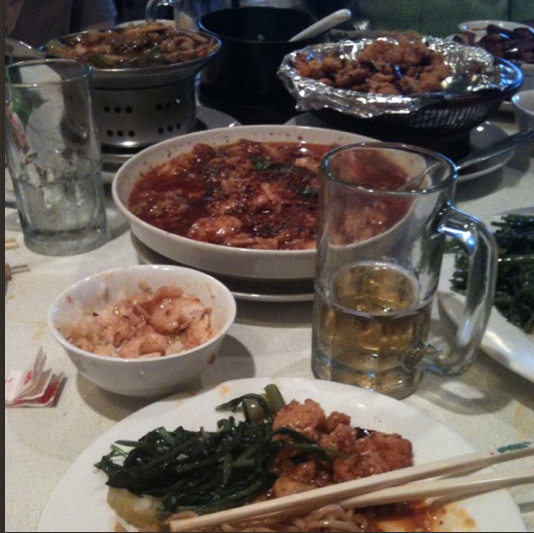 So why am I sharing this photo of an amazingly delicious authentic Szechuan meal that I shared with some friends Saturday evening? I’m going somewhere with this one, I promise. A dear friend invited a group of us for dinner at one of his favorite restaurants Saturday evening. And while yes, the food was outstanding, so was the appearance of the mostly Asian patrons. I thought I did my best to dress casually smart for a night out, black pants, coral colored structured top from Anthropologie and a big snafu, flip flops, (it’s a jog, not a race! ), but I was pale in comparison to the polished and sophisticated wardrobes that surrounded me. I saw a girl wearing a sequin knit dress, loads of super high heels in all colors, little black dresses and not a flip flop in sight! It was the perfect people watching spot. And then out of the corner of my eye I caught a glimpse of the edge of a white shopping bag and all I saw was the edge of a logo and in my head I shouted “PRADA!” I was so proud of myself that I noticed this. A table of all male diners were hosting a birthday party and someone was getting a fab new gift. I think it would be cruel to give someone a Prada shopping bag with something from Target in it, so I figured it must be authentic. Wow! I need to make friends with those folks. My only thought was, “Does anything from Prada cost less than $500?” What could possibly be in that bag? My mind continued to dwell on this until a young girl walked by with one of the Miss Marc Packables Marc Jacobs bags! It’s more of a grocery tote, but I’ve never spent $60 on grocery tote! It then occurred to me, that I’m slowly starting to notice these luxury brands and I started to scour the room looking for other designer bags and shoes. Needless to say, my luck stopped there but I felt like I had made a little progress.